Over the summer, we launched MerchantCircle Neighbors, essentially a social network for consumers to follow their favorite MerchantCircle members. 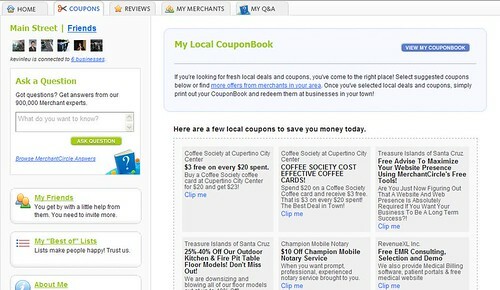 Everyone who has a Neighbor profile can follow their favorite local merchants and get real-time updates when those businesses add new coupons, deals, or promotions. Also, as a business owner, it's a much easier way for you to directly contact your favorite, loyal customers. Ask your best or most loyal customers to create a Neighbors Profile (here) so they can follow your deals in real time. It'll also help you create a lasting relationship with your customers.